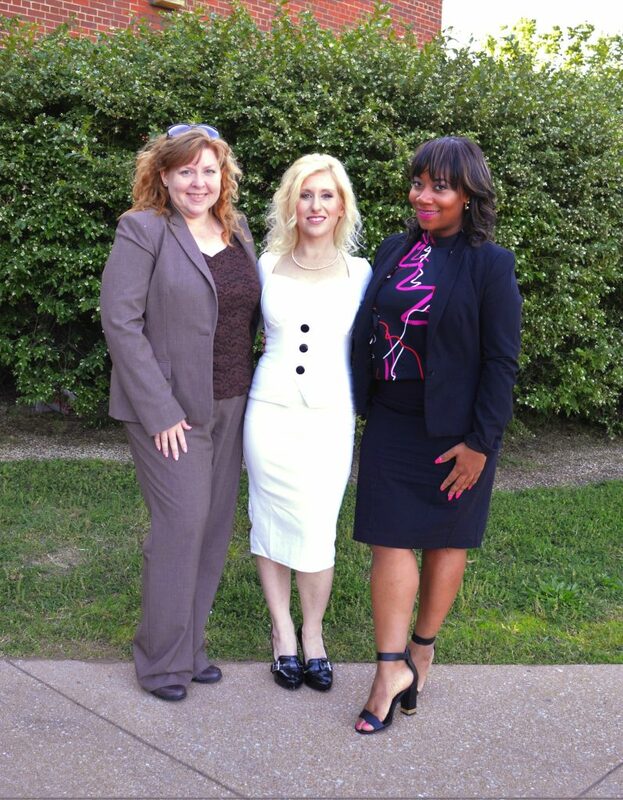 Today, the Missouri State Board of Education livestreamed their June meeting. 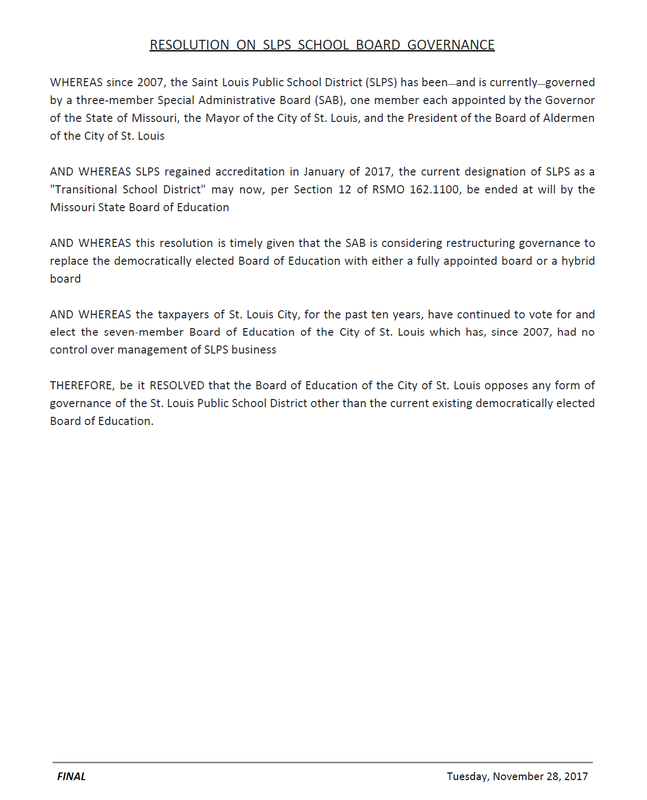 Item X. BB on the agenda was a report by Dr. Victor Lenz on the governance of St. Louis Public Schools. Here is what Dr. Lenz and the other State Board members had to say. This entry was posted in Uncategorized on June 14, 2018 by Natalie A. Vowell. Today, I made phone call to Canada regarding St. Louis Public Schools. The #SLPSgovernance online survey (more info here), in addition to default accepting multiple submissions from the same person or device, lacks a mechanism for verifying a survey respondent’s authenticity through any form of email, Google, or Facebook account-linking. Upon contacting Tiffany, Support Agent for MetroQuest, the Vancouver-based company handling the SLPS Governance online survey, I learned some troubling technical details about the data collection and analysis methods. Instead of implementing backend safeguards to ensure unique data is tied to a specific respondent, the final output is a raw data set exported to an Excel file which is to be manually sorted by Vector Communications‘ data management team, comprised of two individuals. While IP addresses and timestamps for each entry are included in this Excel output file, the data management team possess unilateral authority for pruning all captured data. These individuals may sort entries by IP address, timestamp, email address, or any other data field, including survey answers, when determining how many duplicate survey submissions to strike or retain for the final data set presented to the Task Force (who will make a recommendation to the SAB on the future of SLPS governance structure). Vector Communications’ official reason for not requiring email addresses is that the survey yields more participation because, in their experience, requiring an email address causes more people to “give up” at this final step and users do not complete/submit the survey. “The poll in question accepts data without regard to the source. Meaning the data is not checked for duplicates, or anything that indicates multiple submissions from one user. “There are steps that can be taken to prevent manipulation of an internet poll by a dedicated or interested actor/party. None of those steps seem to have been taken here. No internet poll is completely free from manipulation, but it is possible to make it non-trivial to inflate results, by requiring authentication (even third-party authentication, like log in with Google or Facebook) or having email validation with followup email confirmation. Again, none of that has been done here. It is therefore both trivially easy to manipulate this poll either manually or automatically (with a simple script) and difficult to track any such manipulation (unless there is cookie information saved, or server-side IP logging, or some other means of at least rudimentarily de-duplicating multiple submissions). The best way to make it more difficult to skew the outcome of the SAB’s governance recommendation process is to complete the online survey. The survey takes less than five minutes, but allows for long answer comments if you would like to include further opinions. Survey closes at midnight on November 28th, 2017. This entry was posted in Uncategorized on November 15, 2017 by Natalie A. Vowell. At our June 13 meeting, we held our board officer elections. I’m honored by the literal vote of confidence I received from my fellow board members who unanimously elected me as Secretary of the Board. I am proud to serve as the newest member of our board’s leadership team alongside President Susan Jones and Vice President Katherine Wessling who were both unanimously elected to a second term in their positions. I am committed to transparency, accuracy, accessibility and accountability, and I look forward to remaining St. Louis City’s most eagerly Sunshine Law compliant elected official. This entry was posted in Uncategorized on June 15, 2017 by Natalie A. Vowell. Thank you for your help on our word-of-mouth, organic, grassroots campaign. With no allies in the local big-money institutions, we proved that good intentions, hard work, and dedication can put elections back into the hands of the people: 18,678 people to be exact! This victory belongs not to me, but to all of us—and to the future of St. Louis City. Whether with your time, talent, or treasure, you all made this happen. Our donors were activists. Our phone bank was our friends list. Every yard sign that went up was for someone like you who personally knows me and my work in the community. Our supporters weren’t just voters; they’re our friends and neighbors. For those of you who are local, I’d love for you to attend the official swearing-in ceremony at the next school board meeting on May 9th (Carr Lane VPA Middle School, 1004 N. Jefferson Ave, 63106). Afterward, please join us for a black tie optional cocktail party at Livery Company (8728 S. Broadway, 63111) to continue the celebration. I’m truly humbled by your confidence in me, your belief in my message, and the inspiration you offered along the way. I’m excited to bring my passion to elected office, and I look forward to serving you and yours for the next 4 years—as a member of the St. Louis City Board of Education. This entry was posted in Uncategorized on April 5, 2017 by Natalie A. Vowell. Children may be our best hope for finding solutions for some of St. Louis’ toughest problems. The majority of adults who run this city certainly seem to lack a key quality these students possess: empathy. 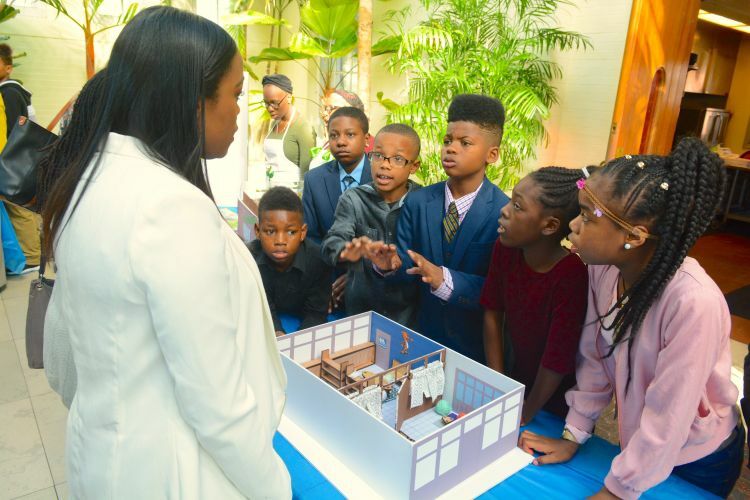 Sandra Jordan of the St. Louis American writes about one group of SLPS students who designed solutions for the very real issues we face. We should commend educators who encourage innovation and creative thinking techniques which prepare our youth for solving real world problems. Fifth grade social entrepreneurs Karon Hunt, Savion Wilson, Jamar Aaron, Paul Thomas, Maya Wilson, and JaNyah Smith from Farragut Elementary School presented their winning design to transform a rundown teacher’s lounge into a quiet study lounge to two of the judges of Saint Louis Public Schools’ Love of Learning Design Challenge. Six teams of finalists from grades 5-12 were asked to find workable solutions for homelessness, food deserts, and lack of safe spaces. This entry was posted in Uncategorized on March 30, 2017 by Natalie A. Vowell. A St. Louis student lived in this northside home, just last year. Today, it sits vacant and abandoned because our City government punishes people in poverty rather than funding our schools. The low-income former owners of this home owed no mortgage; the house was paid off decades ago. They were simply unable to afford their real estate taxes, which provide funding for our schools. Instead of lowering the taxes to an affordable rate so that the property could remain on the tax rolls and still provide some money for public education, state statute dictates the property be auctioned off. This is not an isolated, out-of-the-ordinary situation; dozens of northside families in St. Louis City face this same fate every year. We push low-income homeowners out of their homes, uproot the family, and displace the students, often forcing them to change schools and fall behind on their studies. Even when a property sent to auction fetches zero bids from auction-goers, the property is given to the St. Louis Land Reutilization Authority by default. Management of the property is then turned over to Eagle Realty, a company owned by a wealthy developer. Instead of working with homeowners (many of whom inherited these properties as their only asset), Eagle Realty takes taxpayer money—which should go to our public schools—to evict the homeowner and the board the house up. Yes, we are paying the rich to displace the poor and defund our schools. As long as we continue boarding up the houses of our most marginalized citizens, we will continue boarding up schools in the neighborhoods that need them most. This photograph symbolizes so many things wrong with our educational system. 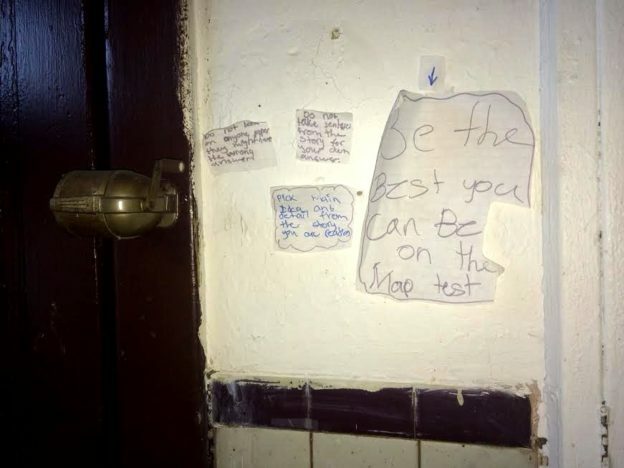 The large sheet of notebook paper encourages our student to perform well on the MAP test, a standardized test which is given at the end of every school year to assess student performance. It is accompanied by notes on test-taking skills. The pencil sharpener mounted on the wall suggests a parent who was dedicated to their child’s academic success. How can we expect our low-income students to achieve high test scores when we treat their families like second-class citizens? Keeping our neighborhood schools open should be a top priority. 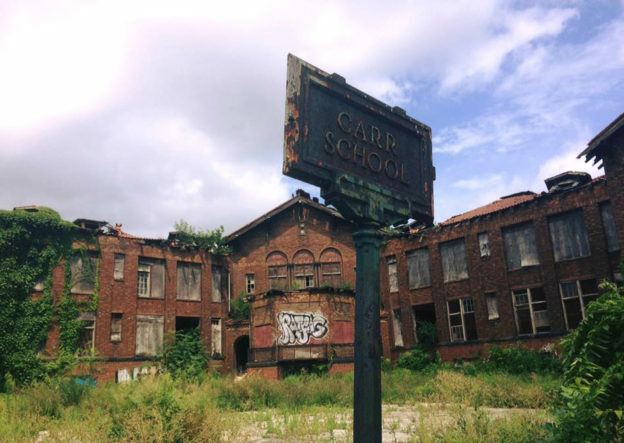 But it seems that St. Louis City prefers to use our schools as warehouses for children in order to fatten the pockets of the privileged and politically-connected, while depriving our kids of the comfort of a stable home environment. Our children suffer mentally, emotionally, and academically with each and every move to a new housing situation. Imagine how much worse that trauma is when the Sheriff’s deputies arrive, ordering them to vacate their longtime family home where a lifetime of memories was made. Imagine how this shapes a child’s view of law enforcement. It’s time we start investing in our students by keeping SLPS families where they want to be. We must stabilize our neighborhoods in order to strengthen our schools. This entry was posted in Uncategorized on March 23, 2017 by Natalie A. Vowell. After the integration of schools, things got worse—not better—for African Americans in St. Louis. A 1971 state statute implemented the seizure of homes with delinquent property taxes, primarily in Black neighborhoods. It’s still in effect. Fully-paid-off homes are taken away, leaving fixed-income seniors/veterans nothing to pass on to their children; each generation must start from scratch. The “bootstraps” argument does not apply when our government keeps confiscating our boots. Neighborhood schools are essential to our district. When kids get up at 5:00 in the morning to catch the bus to a school across town and don’t get home until 6pm or later… When do they eat? When do they spend time with their families and play with their friends? When do they do their homework? How much sleep do they get? How can they be expected to achieve the learning necessary to achieve acceptable MAP test scores? We give obscene amounts of money to the transportation industry to bus our kids all over the city, yet there is usually a boarded-up school within walking distance of every student’s house, not to mention several boarded-up houses along the way. We need schools near where families live—especially here on the northside, where fewer of us have vehicles. 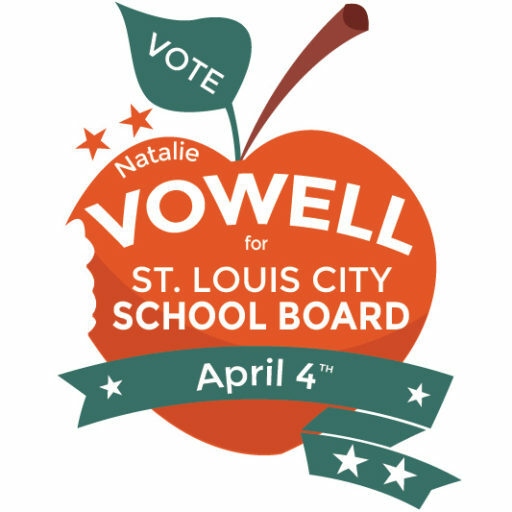 As your St. Louis City School Board member, I will stop using our children as checkbooks to bankroll corporations. Since 2014, I’ve prevented over 60 homes from going to auction and becoming vacant. I will keep fighting our broken system on all fronts, until every child in our city has access to a quality education in their neighborhood—with ZERO systemic barriers to their potential for success. This entry was posted in Uncategorized on March 14, 2017 by Natalie A. Vowell. 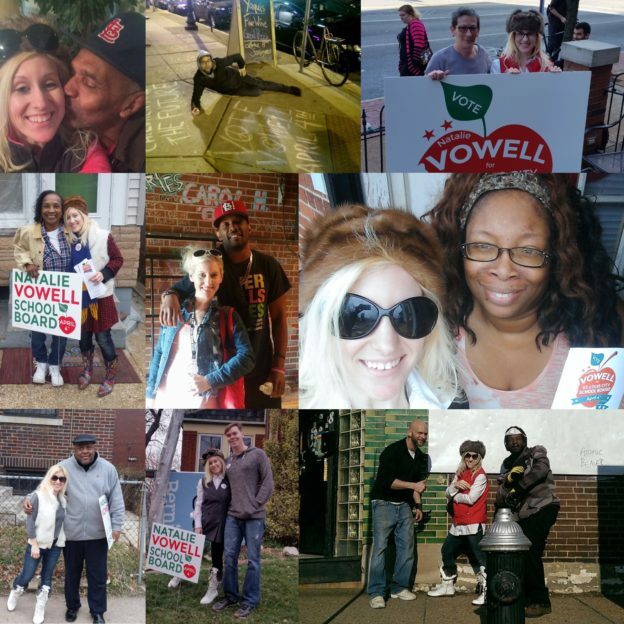 Natalie and her team have been out in the streets since December, knocking doors all over St. Louis City. Our campaign is powered by people. Our donors are activists. Our phone bank is our friends list. Every yard sign that goes up is for someone like you who personally knows Natalie and her work in the community. Our supporters aren’t just voters; they’re friends. This election is in your hands! Join us by signing up here. Thanks for joining us in this revolution! This entry was posted in Uncategorized on March 11, 2017 by Natalie A. Vowell.